A sharp knife is a key tool which makes your kitchen good and strong. If you are among the average household cooks who cook because you just have to, then you may not understand the importance of knife. You will be doing fine with any knife which cuts well. Why do you buy an ordinary knife? Whenever you are in the market, there are chances that you will be buying knife even you have a good one at home. There are probably three reasons that you will buy a new knife. No, actually four; one just struck my mind at the moment. Number one, the knife you are buying has a sharp blade or number two, it has a good handle which makes it convenient to use. The other reason can be that the knife is apparently beautiful and is appealing enough that you will end up buying it. And, lastly, the fourth reason, the knife is super cheap with an apparently sharp blade and handle. Do you know about knife sharpening? Well, all these symptoms indicate that you are not much into cooking. A real cooking enthusiast will look for much more than such factors. But wait; if you are among the former mentioned group of people, then you may also have the least knowledge about sharpening a knife. I am not being offensive, so, calm down. I said you “may not”, so, there is also a possibility that you know the sharpening tactics. Whatsoever category of people you fall in, we will let you know again the sharpening techniques. What does sharpening do to your knife? Good knives often require sharpening. Remember, “Good knives”. Sharpening knives can let them last you longer with a sharp blade. Sharpening brings backs the old glory of the knife and a much sharper blade. It is now up to you, whether to sharpen your dull-edged knife or replace it with a new one. Replacing the knife is also an art which many people lack. After all, you are going to replace the major tool of your kitchen. It surely takes some time to get used to of the new knife. So, it is not less than an art. What about the sharpening angles? At the contrary side, there are people that ask for advice regarding the sharpening angles of the knife. Sharpening angles of a knife may seem like a joke to some. Obviously, if you want to sharpen your knife, just sharp it with some tool. What has the angles have to do with sharpening? You are right at your own place because in the beginning we also didn’t know about the sharpening angles. Alright, so, what we were telling you was the sharpening angles. What people used to do is, they take their dearest knives to a professional knife sharpener and get their knives done from their heavy tools. It is no doubt a good approach if you get your knives super sharp. But for how many times you will take your knives to the market? So, for the cause, you need to learn about the knife sharpeners and the knife sharpening angles. There are various manual and electric tools available for sharpening and honing of the knife. You can buy knife sharpening tools and machines via Amazon or rush to a store nearby to give your knives a long life. Some of them will require a lot of human efforts while the others will do their job automatically. Have you ever heard about 20 degrees knife? You may have heard or read somewhere to sharpen a knife at 20 degrees. People will tell you 20-degree angle is good for sharpening but they won’t tell you the reason. So, here we will clear your confusions. When it is said that a knife is to be sharpened at 20 degrees, then it means that the knife should sharpen each side to 20 degrees. Sharpening both the sides means that the knife has a double bevel. Both sides will add up and make a 40 degrees knife. So, the knife’s original angle is the one at which it requires sharpening. What are the angles to sharpen the knife? However, there are cases that where the total angle is not twice the angle of the sides you sharpen. Just like the typical Asian knives. They have a bevel on one which may be sharpened to 20 degrees while the other remains at 0. So, a single side made it 20 degrees in total. Whereas, the traditional knives sold in the States have a bevel on both the sides. Not all the knives, but the major percentage of it. If you don’t know about the exact angles and the bevel, then it is good to assume that both sides have a bevel. Asian knives can also be assumed to have an angle of 17 degrees with a rough estimate. How to choose the right angle? Choosing the right angle for sharpening is also a tough job at times. First of all, you need to figure out how you are going to use your knife. Are you going to use it for filleting fish or cut down vegetables or chop down meat or simply apply jam to your bread? The sharp knife should have a purpose after all. The durability and sharpness may increase if you sharpen your knife rightly. In the worst case, the results can be reversed. So, be careful about the angle and sharpening tools. Let’s now see what are the sharpening angles and their effects. The knives with such low angles are typically used to cut soft items. Such knives should not be used on hard substances in order to maintain the edges. The lowest angles are typically straight on edge razors. These low angled knives are sharpened to 7- 8 degrees. The straight razors have delicate edges and that is why they are more likely to get easily damaged. So, to keep the razor and your knife safe, don’t use it for tough tasks. The angle of 10 to 17 degrees is also considered to be low while sharpening knives. It is good to have angle range of 20 to 34 degrees, which is a quite fine edge. Whereas, the edge may not let you chop vegetables in a single motion. To cut soft items or slice meat, it is good to have a knife with such edge. It will provide you with a smooth cutting and chopping action. However, the hard steel is brittle and has more chances to get damage. The knives from 17 to 22 degrees are quite common in kitchens. Typically, the Japan manufactured knives are sharpened to 17 degrees angle. The western knives are usually 20 degrees and are considered to be the best. The knives sharpened to 15 to 20 degrees are durable and have a quite sharp edge. However, the angles as a whole are less than 40 degrees. This means that they will not give a good response while treating hard elements. 17 degrees is more often heard while you read about sharpening knives. This is because it is midway between the ideal 15 and 20 degrees. It is extremely sharp with a delicate edge. Also, this angle is perfect for razor blades and scalpels. This angle range is considered to be more durable and sharp. It is primarily made for slicing and chopping materials. It is usually more consistent and last longer. The tools and especially knives with more than 30 degrees angle sharpness are extremely durable. The durable knives can be forced to cut hard at times. The majority knives won’t get much benefit of this angle but can be used in other tools. This angle can be used in various tools to damage other edges, such as ax and cleaver. Many people feel good whenever they are using a high quality and sharp knife. Steel knives are appreciated; however, its hardness factors are still there. The hardness of steel can be measured on a Rockwell C Scale. This scale is used to understand and measure the hardness of the steel. The ability of a material to withstand fracture is considered to be its toughness. A common example of the hard material is glass and is not at all tough. Making a knife harder can reduce its toughness and when steel is treated by a knife maker, the hardness and toughness should be balanced. A hard knife can easily break and a softer one will not hold a sharp edge. You have to be efficient enough to choose the knife with balanced hardness and toughness. Maybe enough debate on the knife sharpening angles and the hardness and toughness factor. Let’s come to the 1000 degree knife. You may think of how a knife can be at 1000 degrees. Well, I am not joking. But here’s a difference between the 1000 degree angle and 1000 degree temperature. When 1000 degree knife originated? Thousand degree knives became viral on social media and this is how the term popularized. It all started off with a YouTube with the username Mr.Gear. He uploaded a video in the second last week of December 2016 in which he showed an experiment. He did something really amazing in the video. He heated the kitchen knife with a searing kitchen torch until the knife turned bright red. Not only he heated the knife, but later he sliced a bottle of Coca-Cola which amazed its viewers. How did it become Viral? The video received more than 60 million views in less than 12 days. Soon after the video went viral, he experimented more. He made videos of himself cutting different objects with a hot knife. The more his videos became viral, the more other YouTubers were inspired to make similar videos to promote their channel. This is how the concept of thousand degrees knife was generated and got viral via videos and memes. Who can deny the power of social media? It is the most powerful medium to share information, views and some exciting experiments. So, you can imagine how much fame Mr.Gear would have enjoyed. What more than a bottle of Coca-Cola? Not only had the slicing of the bottle of Coca-Cola made it famous. The popularity increased when a wide range of other objects was used. The man sliced through pop bottles, soap, lighters, and even Pokemon cards. Well, the objects don’t end there. There is a lot more he sliced with his glowing knife. He sliced through yogurt and action figures and a few books. Was cutting the only reason? You may or may not be convinced that a video can go viral in which an object is only being cut. But this is true; the demand for more cutting videos was seen with more victimized objects. Another reason for its popularity was the use of the concept in videos of famous YouTubers. Many people from YouTubers to bloggers followed the same to increase their view-count and this is how a thousand degree knife became famous. On one side they were increasing their rating, and on the other, they were spreading a whole new technique. How social media helped out? So, here is another example of how powerful and viral social media is. Like, share, comment, upload, share and the cycle goes on repeating. This is how social media works and the ordinary knives can get fame. How to take your knife to 1000 degrees? For heating, your knife to high temperature is not so difficult. You can easily make your knife glowing hot and cut things out of it. Cutting and slicing from a thousand degree knife doesn’t require the sharpest blade, but the right temperature. We have some exciting products for your thousand degrees knife. You don’t have to use your stovetop burners to heat your knife. There are several tools available for helping you out in the process. This culinary torch is best for searing food and heating knife. It has a safety lock so that the children don’t ignite it accidentally. The sturdy fixed base prevents it from falling down and the flame guard prevents flaring. The hand protection plate guards you against the high heat flames released by the torch. It can be used to give your baked Alaska a beautiful texture and to heat your knife to slice down objects. The torch will give a secure and confident feel and is extremely easy to control. To buy this torch via Amazon, visit the link below. 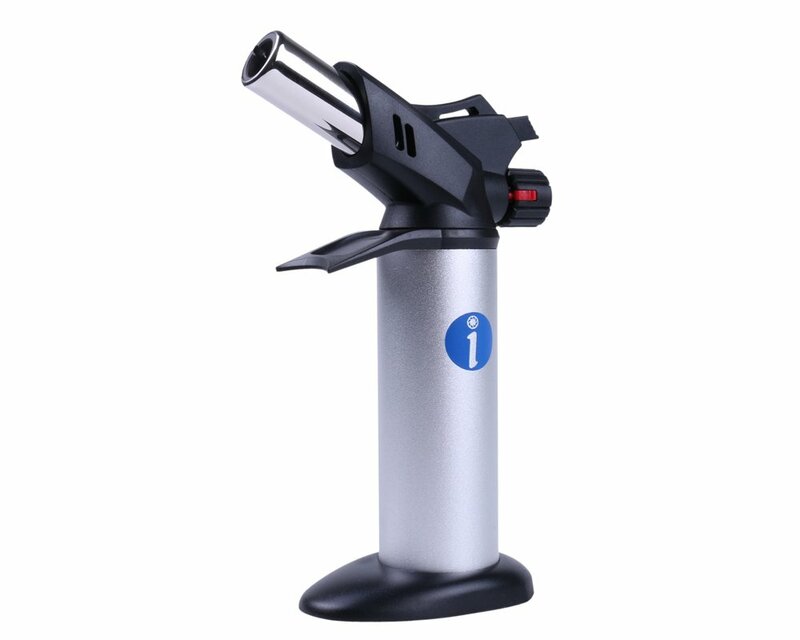 The Ingeniosity torch uses Butane as fuel which provides heating at low temperature. Butane gas is considered to be safe for beginners. Which is the appropriate fuel to use? However, for heating the knife at 1000 degree, a fuel that provides high temperature is the best. Propane and Map-Pro gas are recommended to use while playing with such high temperatures. Which knife should be used? You should use strong knives for this purpose and not the ordinary ones with plastic handles. The plastic will absorb heat and will burn your hand. So, prefer a knife with a strong blade and an insulating handle. What to do with 1000 degree knife? The 1000 degree knives can help you out in slicing down as many objects as many you can think of. However, you can use it in your everyday life with comparatively low temperature to slice out hard substances.